© 2010 Artist of Life Music and Films. All Rights Reserved. 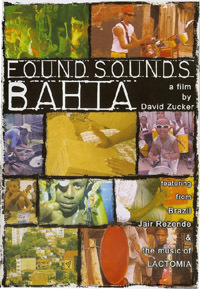 Found Sounds Bahia isn’t just an entertaining film. It’s also full of ideas and possibilities that you can explore on your own or bring back to your community. The film motivates you to think not only about the value of reuse and recycling, but also things like the role of community leaders in inspiring young people, the need for artistic expression in community life, and the different forms that creativity can take. Because it is about a group of young people, Found Sounds Bahia has the potential to be particularly meaningful for young people and those who work with them as teachers, community leaders and even parents. On this page you’ll find a few thoughts on how Found Sounds Bahia can work in the classroom or in other contexts with young people. What follows here are several topics for discussion following a viewing of the film, with an emphasis on ideas which might lead to group projects or other actions and activities. How are the young people shown in Found Sounds Bahia like or unlike the youth in your community? Do they have different wants, needs, or interests? Candeal, the community in which the film takes place, is a low-income area in the Brazilian state of Bahia. Does that background make these kids different from American kids or kids from wealthier backgrounds? The young people in the film like what they’re doing with the musical group Lactomia – they think it’s cool. Do kids in different places and from different backgrounds usually think the same sorts of things are cool? Or is what’s cool different in different places? The film shows how the young man Jair Rezende set out to create a musical group using recycled materials to make the instruments. Would a project like this work in your community? Could it be done through school, a church organization or community organization? Could it be done in partnership with a local landfill, or with a local conservation organization? Are there musicians or other artists in the community who would like to give their time by helping to develop and guide such a project? Would the kids be into it? The young people in the film use recycled materials to make musical instruments and costumes for their performances. These are great creative ideas! But are there other sorts of things you can do to make use of commonly available throw-away materials in your area? What about other sorts of art – sculpture or site-specific installations? Stage sets for theatrical performances? It’s also possible to use recycled materials to make useful things that aren’t necessarily artistic. For instance, some people have made very good sandals using the rubber from old tires to make the soles. They work fine and the rubber soles lasts forever! Can you think of other practical items that can be made from recyclables? Might some of them even have economic value, with the potential to raise money for a worthy cause or for the students themselves? Most of the musical instruments Lactomia was shown playing were percussion instruments. But many other sorts of instruments can be made from recyclables. Can you come up with ideas? Many pieces of scrap metal make excellent chimes and bells. You can create tuned sets to play melodies either by trying out many scrap metal pieces to find those that make a nice scale, or by cutting pieces to different lengths. Remember that how the objects are held or supported, and what you strike them with, make a big difference in the sound. For a really good selection, look for good-sounding metal shapes in a scrap metal yard. In the film you can see people playing on individual tin cans with sticks. If you create a whole set of tin cans of different sizes and tones, you can have a unique and effective melody instrument. In the film, Jair mentioned briefly a type of tube that makes a nice tone when you whirl it. This effect is associated with corrugated flex tubes, which may be of plastic or metal. Large-diameter plastic flex tubes (anything over about 1/4″ in diameter) work well with whirling. Smaller tubes, plastic or metal, can be played by blowing. Each tube can make several different notes depending on how fast you whirl or how hard you blow. Narrow-necked glass or plastic bottles such as pop bottles can be played by blowing over the rim. Tune them to different pitches by adding water to vary the size of the air chamber inside. (For a permanent tuning, use plaster of Paris instead of water.) In addition, plastic bottles with just the flared portion of the neck cut out can make flared bells for the ends of wind instrument tubes, enhancing the sound and the appearance. With glass bottles or jars you can make tuned sets for percussion, tuned once again by adding different amounts of water. Some pieces of scrap wood and scrap metal tubing can work very well for marimba-like instruments (sets of tuned bars). To sound well, they should be supported in a way that lets them vibrate well: rest the bars over a pair of pads so that between a fourth and a fifth of the bar overhangs its pad at each end. Tune by cutting to length or (for wood) by thinning at the center. Bubble wrap: Pop it in rhythm; try dancing on it! The large bubble kind is better than small bubble. The topics and ideas you’ve seen here are just starters. You may come up with other, equally effective discussion topics and project ideas to explore. Ideas from Found Sounds Bahia. Cool, Creative, Constructive. Visit our online store! Vibrant art and music, bright-eyed children, and engaged and creative adults, all in this distinctive Afro-Brazilian cultural context – these things are inherently inspiring. They also give rise to thoughts and ideas that go beyond this particular context. Because it is very much community-oriented, the film has the potential to be particularly motivating for people who work as teachers, community leaders, and parents. On this page you’ll find a few thoughts on how Colors of a Creative Culture can work in the classroom or in other community contexts. What follows here are several topics for discussion following a viewing of the film, with an emphasis on ideas which might lead to group projects or other actions and activities. Each community — in Brazil, in the United States, and elsewhere — has its own cultural heritage, history, economic realities, and physical characteristics. Is the city of Salvador, where the film takes place, very different from your community? What do the people there share in common with your community, and what are the differences? Given these characteristics, would the arts projects depicted in the film work well in your community? What are the differences between public art, graffiti and display advertising? In many places and cultures, creative work is most often rooted within the context of surrounding points of reference such as community, ritual and belief, politics, or cycles of nature. In some European and American art, by contrast, there is a stronger component of individualism, a sense of the artist as the lonely visionary, and an emphasis on purely personal self expression. Are these two orientations incompatible? Does one have greater validity than the other? Do artists in your community tend to reflect one approach more than the other? In this film, everyone seems to take part, including both trained artists and people young and old with no training at all. Is artistic training important? Is it a problem that some of the people doing the painting have no training in visual arts? Should there be a clear delineation between people who are seen as artists and people who are not, or are we all artists? The artists and young people in Colors of a Creative Culture combine self-expression with community improvement using paints and brushes. Are there other, similar activities that could serve the same purpose? Would your community be better suited to different sorts of activities? A day that emphasizes open-air music and community music groups; maybe some open-air theater or other performances. A day that emphasizes community-based art, but with temporary displays and installations rather than permanent. Other forms of visual art, such as sculpture. Would a single community-designed and -built monument or sculpture be better than painting? How about creating new public spaces, such as designing a park or children’s playground? Or creatively designed and decorated benches, bus shelters, or other useful public structures? Could something take shape as a community-based writing project, perhaps leading to a book or newsletter, both from and for the community? How about a photography project? Is there a way to take the creative energy seen in the film and channel it into plantings of greenery, or even something as prosaic as litter pickup? And if you do litter pickup, consider this: is there potential for art work based in recycled materials? For example creating instruments & music made from found objects or designing fashion accessories for performance costumes. 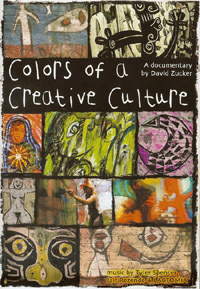 Ideas from Colors of a Creative Culture. Cool, Creative, Constructive. Visit our online store!